This is about basic reference books which can support your study, whether that's at home or on a course. I'm not going to discuss phrasebooks. They're great if you're going on a trip somewhere and you simply want something you can stick in your pocket, to help you recognise and understand some of what you see and hear around you, but they're not books you can effectively study with. And coursebooks are best left for another article. Any decision about a coursebook is best made together with your Finnish teacher. Don't be surprised if your class decides not to use a coursebook at all. They require a hefty investment and used properly they usually necessitate buying some cds as well. Teach Yourself Finnish by Terttu Leney. This suggestion may seem like the most unimaginative I could possibly make, but hear me out. 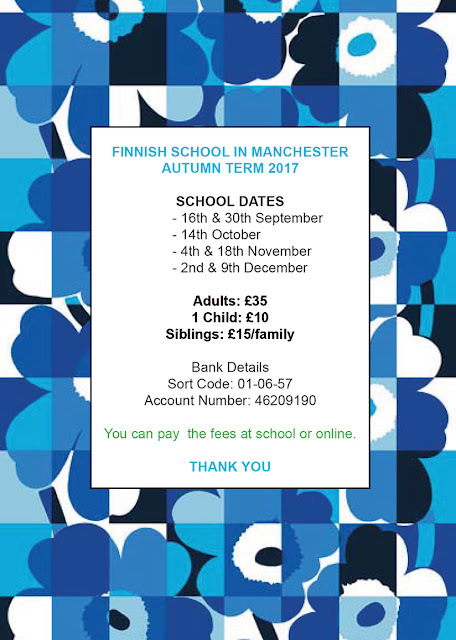 You may well hesitate seeing that bunch of five books at the top, when you're not even sure you're going to get on with Finnish. So here's my best suggestion for a single book to make a start on. And not just a start: follow it through in the way it's intended to be used, and you'll pick up much of the basics of the grammar, and a good measure of common vocabulary. True, it is to some extent a coursebook, but it's not one you'll use in class, it's a smallish volume and it only goes so far. My main point is that it does serve as a fair introduction to the language. And it has two major plus points: it's cheap-ish, even if you get the pack with cds, and it's easy to get hold of in the UK. 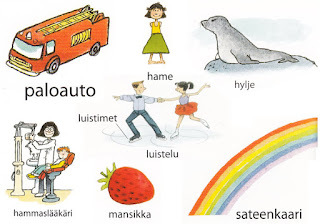 In fact, it's the only Finnish language book you can really say that about. Note that there are several editions, and what you find may not look like the example on the right. is to get a set of reference books, as follows. I'd better say, yes, I'm going to talk about particular books I personally prefer, but I'm recommending five types of book, and there are alternatives for most of them. A pocket dictionary. My example is Gummerus' Suomi englanti suomi, 'The Little Yellow Dictionary'. This is not the only pocket dictionary I've had, but it's brilliant and when it falls apart I'm getting another. 51,000 headwords is pretty amazing for the size. As with all such books, the pages are thin and you can fumble sometimes, trying to find the right page. But the content is excellent, and does include examples of usage. A big dictionary. I'm very happy with mine, though physically you might say it's on life support. It's WSOY's Suomi-englanti-suomi sanakirja, which has 117,000 headwords. You need a book like this on your desk, not just because it has more words but because it's more practical to leaf through. For me, it's most valuable because it provides so many examples of usage. Believe me - usko pois! - you need that. I'd better point out that Gummerus publish a comparable sanakirja (literally, 'word book') and a smart classmate of mine uses that one. A verb book. The one book here about which I feel like saying, 'Get this book!' 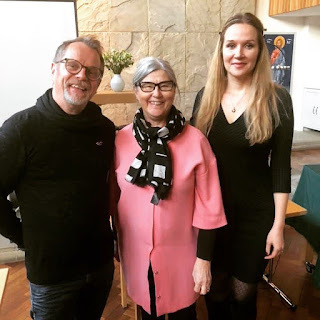 Zsuzsanna Oinas' Guide to Finnish Verbs (pub. 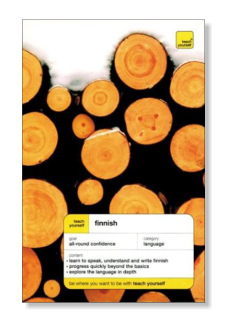 Finnlibri) is in my view the essential tool for hacking the monster that is the Finnish verb. Yes, there are other verb books, but for me this is the one. Why? 120 verbs fully conjugated, and 1200 verbs in the index. It's certainly comprehensive, but I'd focus on how its organised so that you can conjugate any verb you want, because you can quickly find another verb in here which works the same way. 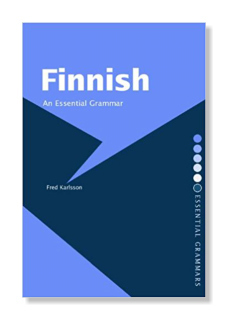 Furthermore, there's a short but invaluable grammar section at the start which I found particularly good at guiding me through the minefield of Finnish infinitives and participles. A declension book. This is the only declension book I've spotted: it's Zsuzsanna Oinas' other essential volume, her Guide to Finnish Declension (pub. Finnlibri). I do refer to this a lot, but I must be honest, it doesn't seem quite so well organised as her verb book. I've sometimes spent ages trying to find which type the word I want fits in to. Also, I've actually written in one or two extra tables myself in the back! To be fair, it's a complex subject and there's probably no perfect way to deal with it in a slim volume. Still very useful, and like with the verb book, as you use it, the big picture takes shape in your mind. A grammar book. You really want an English language grammar, and there are two popular and widely available volumes. There up on the right is possibly the best known; Fred Karlsson's Finnish An Essential Grammar. I have both of them and Karlsson's is perfectly good. But the proof is in the pudding as they say, and I've found myself opening Leila White's A Grammar Book of Finnish most of the time. It's that little bit more straightforward and unfussy, and it methodically covers all the grammar you want, with loads of good practical examples. In my humble opinion, it's especially valuable in the way that it deals with sentence construction. A last picture for you, in case you're a little sceptical about my actual use of these books. That little dictionary goes with me to Finland without fail, and to every Finnish class. I'm amazed it's still in one piece. As you can see, my big dictionary - an earlier edition of the one at the top - isn't, and I've had to resort to duck tape. That one doesn't get taken on trips any more, and I've stopped taking the grammar book too. If I carry more than one book with me, it's the verb book.